Kiidjärve–Kooraste Recreation Area is located in the northern part of Põlva County, 40 km from Tartu and 10 km from Põlva. Through the area flows the Ahja River. The woodland in the curves of the river extends over 80 square kms and is rich in berries and mushrooms and also remarkably interesting for various archaeological, historical and natural attractions. This is why the highlights of this recreation area are nature-educational hiking trips. Attractions Primeval valley of the Ahja River with sandstone outcrops, Kooraste valleys with rivers and lakes, scenic forest areas, impressive bog patches, varied terrain. Activities Walking and cycling trips, boat and canoeing trips, orienteering, nature-educational study trips, nature observation, picking mushrooms and berries, fishing. 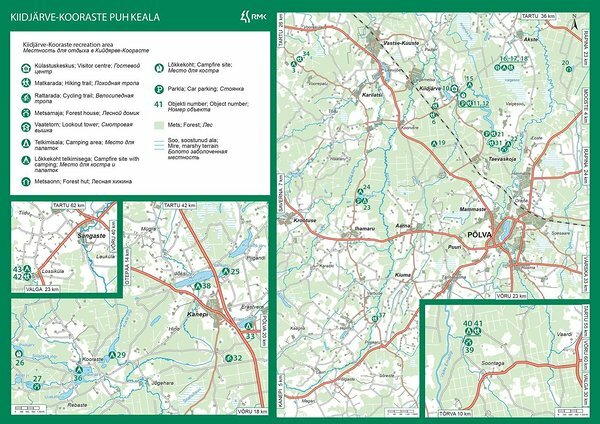 Partners For active recreation opportunities in RMK Kiidjärve–Kooraste Recreation Area, please refer to the home page of RMK’s partner Matkajuht OÜ. Files A brochure of the Ahja River Ancient Valley Landscape Protection Area was issued by Environmental Board 2012. Download PDF.